Residents and visitors alike won’t have to look far for beaches in Alabama. A southern, coastal U.S. state, Alabama has 97 coastal beaches that stretch along the Gulf of Mexico coast plus over 110km of bay and island shoreline. Warm temperatures from April through to October and hot peak summers months make Alabama the perfect state for swimming. Alabamans can get out to their favourite swim spots year round, whether these are along the coast or farther inland. There are many white sandy beaches in the southern part of the state. Waters are usually warm enough to spend the day swimming at the beach. Popular destinations include Gulf Shores Beach and Orange Beach. Bon Secour National Wildlife Refuge features gorgeous swimmable beaches. 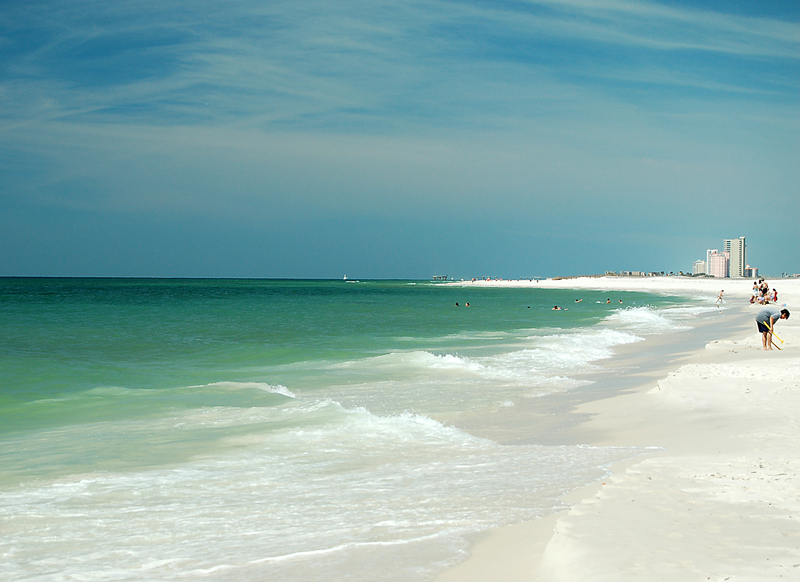 It is located on the Fort Morgan Peninsula on the Gulf Coast. Its beaches are excellent places for a day trip and a long swim. Wildlife enthusiasts will also find plenty of biodiversity along Alabama’s coast. Be prepared for sightings of sea turtles, herons, and pelicans. However, always give wildlife plenty of space so as not to disturb their mating or feeding behaviours. Inland lakes are equally popular in the state. Swimming, boating, water skiing, and other recreational water activities are common throughout its freshwater lakes. Alabama boasts over 124,000 km of rivers and streams. It has more freshwater biodiversity than any other state. Rivers and creeks are favoured swim spots for locals looking to cool off throughout the summer months. Little River Canyon, for example, is a loved swimming hole. Beautiful scenery and cool waters make for an adventurous day for those who can’t reach the coast.